This unconscious mimicry is quite interesting to observe. Take for example, the two men standing at the hotel bar in Figure 134. 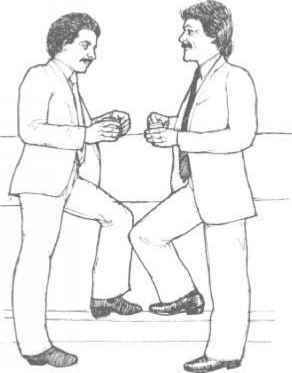 They have mirrored each other's gestures and it is reasonable to assume that they are discussing a topic upon which they have the same thoughts and feelings. If one man uncrosses his arms and legs or stands on the other foot, the other will follow. If one puts his hand in his pocket, the other will copy and this mimicry will continue for as long as the two men are in agreement. This copying also occurs among good friends or people at the same status level and it is common to see married couples walk, stand, sit and move in identical ways. Scheflen found that people who are strangers studiously avoid holding mutual positions. The significance of carbon copying can be one of the most important non-verbal lessons we can learn, for this is one way that others tell us that they agree with us or like us. It is also a way for us to tell others that we like them, by simply copying their gestures. If an employer wishes to develop an immediate rapport and create a relaxed atmosphere with an employee, he need only copy the employee's posture to achieve this end. Similarly, an up-and-coming employee may be seen copying his boss's gestures in an attempt to show agreement. 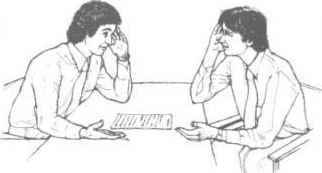 Using this knowledge, it is possible to influence a face-to-face encounter by copying the positive gestures and postures of the other person. This has the effect of putting the other person in a receptive and relaxed frame of mind, as he can 'see' that you understand his point of view (Figure 135). When I was selling insurance I found this a very effective technique for a 'cold' prospective customer. I deliberately copied each movement the prospective customer made until I felt I had established a strong enough rapport to allow the presentation to proceed. Invariably, if the prospect began copying my gestures, a sale would result. However, before copying the other person's gestures when negotiating, it is vital that your relationship with that person be taken into consideration. Let's say, for example, that the junior clerk of a large corporation has asked for a pay rise and is called into the manager's office. As he walks in, the manager asks him to sit down and then assumes a superiority T-cross gesture (Figure 96) and a figure 4 leg lock (Figure 81) while he leans back in his chair to show the clerk his superior, dominant and competitive attitude. What would happen if the clerk then copied the manager's dominant posture while discussing his potential salary rise (Figure 136)? Even if the clerk's verbal communication were on the subordinate level, the manager would feel intimidated and even insulted by the clerk's non-verbal behaviour and the clerk's job could be in jeopardy. This manoeuvre is a highly effective method of disarming 'superior' types who try to take the control. 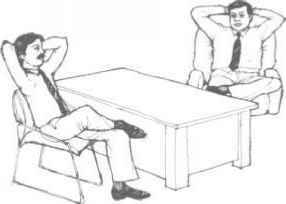 Accountants, lawyers and management personnel are known for assuming these postures in the presence of people whom they consider inferior. By taking the same posture, you can effectively disconcert them and force them to change their position, allowing you to take the control. Research shows that when the leader of a group uses certain gestures and positions, subordinates copy them. Leaders also tend to be the first of a group to walk through a doorway and they like to sit on the end of a couch or bench seat rather than in the centre. When a group of executives walk into a room, the boss usually goes first. When executives are seated in the board room, the boss usually sits at the head of the table, often farthest from the door. If the boss sits with a hands-behind-head T-cross gesture (Figure 96), his subordinates will copy. People who sell to married couples in their home are well advised to watch the couple's gestures, to see who initiates the gestures and who follows. For example, if the husband is doing all the talking and the wife sits there saying nothing, but you notice that the husband copies his wife's gestures, you will inevitably find that she makes the decisions and writes the cheques, so it is a good idea to direct your presentation to her. 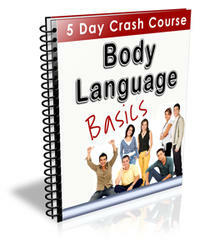 If you can answer yes to the following questions you want this course. Have you been looking for a great way to get more subscribers? Do you constantly seek quality information to provide to your readers? Have you been looking for a way to quickly increase awareness, traffic and profits for your business?